Rosemary Laing explores the power of photography to invoke and unravel assumptions about landscape and place. Her interventions in the landscape are informed by its history of human encounters and powerful symbolic presence in the Australian psyche. In her series 'one dozen unnatural disasters in the Australian landscape', Laing responds to the desert as a place of belonging for traditional land owners and also a place of disjuncture for the many non-Indigenous people who have failed to adapt to its challenging conditions. Emanating from this series, 'Brumby mound #2' alludes to tensions between the global and local, generic and specific, familiar and strange. 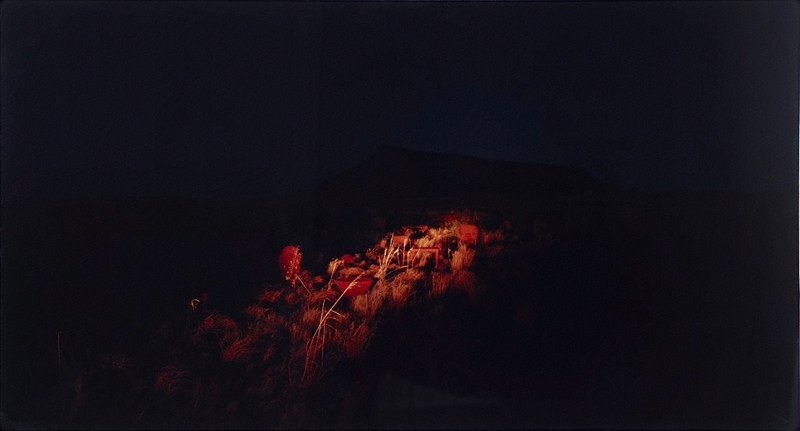 The work captures the enigmatic act of camouflaging ordinary home furnishings in a desert landscape, a traditional land, veiled by the darkness of night. Its title references the introduced horses (or brumbies) that are feral and roam uncontrolled, reflecting perhaps the spread of mass-produced furniture in a consumption-driven society. Signed and dated l.l. verso on backboard, black fibre-tipped pen "Rosemary Laing/ .../ ... 2003".